Acorn Cottage in Bowness-on-Windermere, Cumbria sleeps 6 people. 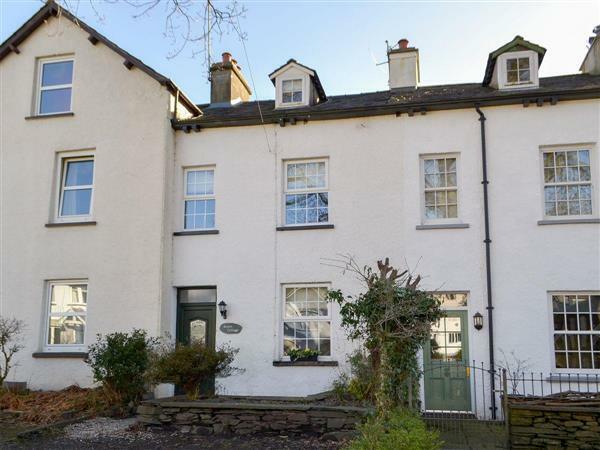 Acorn Cottage in Bowness-on-Windermere is a traditional, late Victorian terraced house; Acorn Cottage sits in a small, pleasant cul-de-sac, and is ideally placed to benefit from close proximity to both of the popular Lakeland destinations of Windermere and Bowness. Slightly closer to Bowness, with the facilities and amenities just a short stroll away, the cottage has the advantage of off road parking. With accommodation over three floors, the property is ideal for couples, families and friends. Whilst retaining the charm of a cottage property, the bedrooms are well proportioned, with an en-suite shower room in the attic bedroom. The cosy living room has a wood burner for those cooler evenings, and the kitchen/dining room offers a cheery space for eating together, that’s if you are not tempted by the very convenient restaurants and cafés close at hand! Full of charm and character, with a typically Lakeland appeal in its architecture, the town of Bowness sits on the shore of Lake Windermere and truly offers something for everyone. Guests of Acorn Cottage will find an eclectic selection of independent retailers, pavement cafés, international restaurants and pubs. Traditional steamers offers rides across the lake, or the car ferry will take you over to the Western Fells. A stroll up to Windermere, or ’the village’, again offers a great mix for all, as well as access to the train station for guests wishing to explore a little further. Walkers of all abilities head to this picturesque area throughout the year. Whether seasoned hikers, or guests preferring a fair weather stroll, the delightful surroundings of this picturesque corner of Cumbria never fails to draw back guests year after year. The beach is 15 miles from Acorn Cottage in Bowness-on-Windermere. With the shop, pub and restaurant 200 yards from Acorn Cottage. Ground Floor: 2 steps to entrance. Second Floor: Bedroom 3: With double bed, restricted head height and en-suite with shower cubicle, toilet and heated towel rail. Gas central heating, electricity, bed linen, towels and Wi-Fi included. Logs for wood burner available locally. Sitting-out area with outdoor furniture. Bike store. Private parking for 2 cars. No smoking. Holidays at Acorn Cottage run from Friday to Friday. Do you want to holiday near Acorn Cottage (UK1187), you can see other cottages within 25 miles of Acorn Cottage; have a look to find your perfect holiday location.